Ever notice how many superheroes and heroines sport cuff-style bracelets? 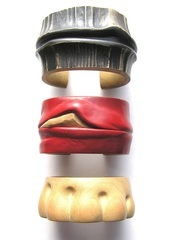 No doubt about it, the cuff is a powerful piece of jewelry--especially when you carve it yourself from solid wood. Learn a wide range of skills from this challenging project: lay out your design for maximum strength, practice rapid roughing and careful carving, fine-tune for a comfortable fit, and add your favorite natural or decorative finish. No previous experience or superpowers required! Thanks for your interest in the "Carve a Cuff" workshop! Cuffs are one of my favorite pieces to make and to wear but because the fit is so finicky I rarely sell them. I decided to offer this class after seeing would-be customers sadly put back a cuff that was too big or too small; each student in this class will end up with a cuff that's just right. Since our time is limited, I will be bringing pre-cut cuff blanks--but I will also demonstrate cutting one during class so you'll be able to do it yourself. 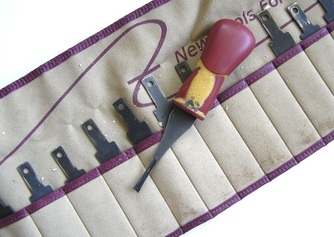 I will also bring an assortment of carving tools that students can share. 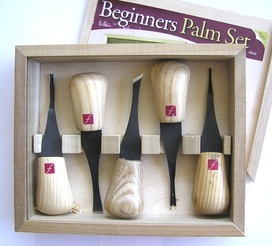 If you think that you will want to continue carving, I urge you to consider purchasing and bringing 1-3 of the carving tools below so that I can show you how to use and sharpen them.